How much time should you spend creating and promoting your online content? What’s the relationship between search and social media? 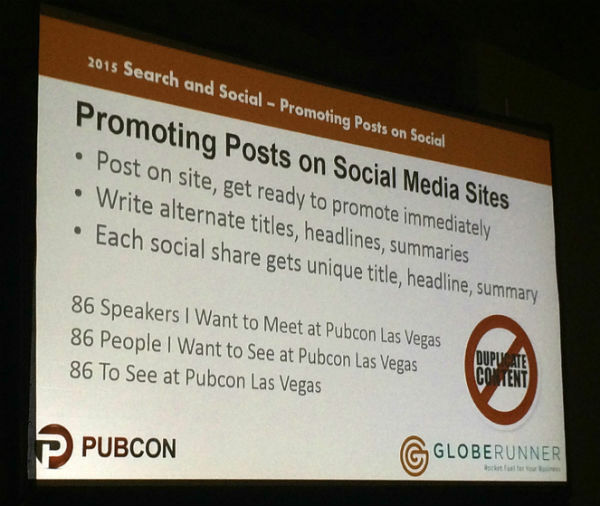 Get practical and effective content tips from the experts in this Pubcon Las Vegas session called “Search and Social Content Strategy.” Jordan Kasteler, our very own Mindy Weinstein, and Bill Hartzer all share their unique tactics for how to improve content that wins for both SEO and social campaigns. CoSchedule says you should spend at least one quarter of the amount of time you spend creating the content to promote it. Jordan says that’s the minimum, and you should spend an equal amount of time creating as you do promoting. He gives us a few examples of shared content success stories. His point is that there is no correlation between shares and traffic. 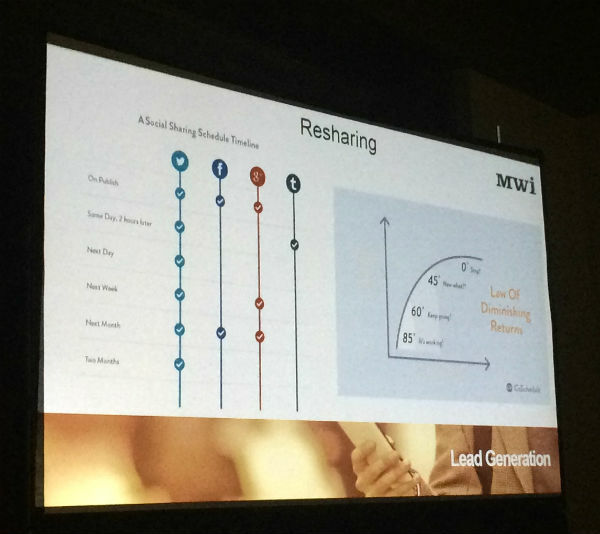 People share content without consuming (reading) it. Don’t spam. Use tactics sparingly. Don’t share if you don’t feel good about your content. If it isn’t good enough, make it better or don’t share it. Link sharing sites (examples he gives are Delicious, StumbleUpon, Reddit) let you submit content into democratic voting systems. It can propel content up to tens or hundreds of thousands of page views. Niche link sharing sites: Inbound.org, GrowthHackers, BizSugar, and Lawster. Social groups: Post to LinkedIn Groups, Google+ Communities, Facebook Groups — the real value of LinkedIn, Google+ and even Facebook is in the power of groups. It’s a niche community of people who are engaged, have their own blogs, and may share and propel your content. Niche forums: There are still niche forums that can drive traffic to your audience. If it’s a credible forum, there are community rules. Syndication sites: BuzzFeed, Tumblr, Medium, LinkedIn Pulse. Copy and paste the content and at the end link to the “source.” If you do a private syndication site (like a very niche blog), make sure to indicate the canonical source of the content with rel=canonical. Paid syndication sites: Outbrain, Taboola — these are the sources you see as “related content” or links in Huffington Post, for example. It’s especially good for clickbait-like content. Make it easy to share and link: Include social media share icons or embed code. Narrow down the options that you want people to use to share. Email others: Send weekly or monthly emails of your top posts and reach out to influencers. Sharing timing: Test this out on your own. Time your scheduled Facebook posts, 5 to 10 minutes before the hour. People waiting on phone calls may be more inclined to click on your content. As far as resharing, Twitter is where you have the most leeway for sharing multiple times. People often share once and don’t reshare, which is a lost opportunity. As a rule of thumb, reshare until people stop engaging with the content. Support sharers of your content: See how people shared your content. If you see people continuing to support you, support their content, too. It’s a reciprocal feedback loop. Support comments and reply to every comment. Cross-promote between paid, owned and earned. Use your email signature to show people where you write content. You have so many metrics. You see time spent, bounces, exits, on-page metrics, social metrics. How do you know which to look at to decide if content is successful? Look at the Moz “the one metric” post (here) and you can pull in all these metrics and combine them with a weighted score. This provides an idea of how content is performing at a glance. Search & Social Content Strategy by Mindy Weinstein from Bruce Clay, Inc.
How do you create the content right? Only by knowing the people who are going to read it and share it. Know your audience inside and out. 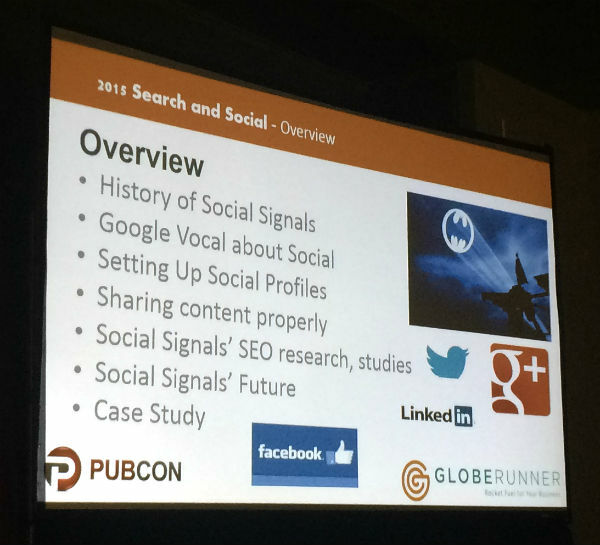 Understand the relationship between search and social. Publish the right content for the right people. Think about the evolution of the user, as search engines are following it. Focus on who you’re trying to connect with. Keyword research is one secret to understanding what words your audience is using. A tool for the job: Search Engine Optimization/KSP tool. Surveys can take out the mystery. Use SurveyMonkey.com to ask customers what matters to them and what questions they have. Talk to your customers or people in your company who are on the front lines. Look at the Share a Coke campaign. People’s names on Coke cans are highly shareable because everyone’s name is their favorite word. Understand the relationship between social and search because your SEO job is to be the expert. Social expands your reach and visibility (so does search), but your focus should be on relationships and engagement. Lush Cosmetics is her example of a brand that does this right. Content ideas: Publish the right content for the right people. Check out SocialMention for idea generation. Mindy gives an example of the Domestic Violence Center. Their website and social media posts were focused on victims of domestic violence, but those channels were really supposed to gain more donor support. Their first event after Mindy started working on their web content brought them three times (3x) the donations. Posting frequency: What’s the right frequency? There’s no one answer. Look at what your competitors are doing. What do your customers expect? Tool to try: Perchapp.com. Titles: Create headlines that attract search engines and readers — then create headlines for your social networks! Tool she likes: Emotional Marketing Value Headline Analyzer. The tool scores and EMV (emotional marketing value) of a given headline. Bill Hartzer (@bhartzer) is senior SEO strategist for Globe Runner. He’s been doing organic/natural SEO since 1996. He’ll give a history of social signals and how they impact rankings. Real-time search launched in December 2009. 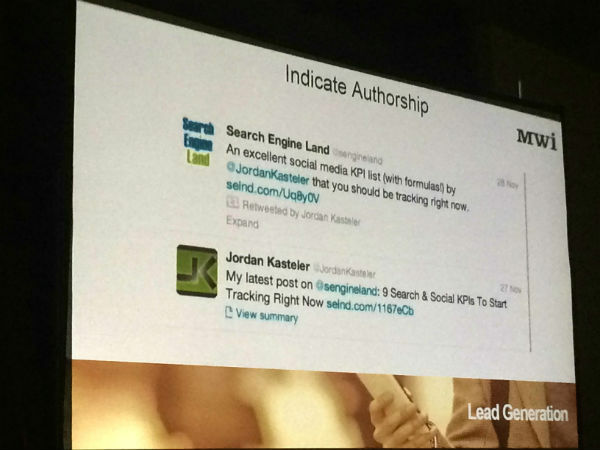 Google started to show a Twitter fire hose of tweets in search results. In July 2011, the Twitter fire hose ended and then, just this year it’s been reinstated. Google’s goal in 2009 is the same as today — to have the freshest and most relevant content in search results. Bill says that he expects that in 2019, Google could be using social signals 100 percent of the time, and maybe today it’s more like 50 percent. What can you do now? Set up social profiles, post something on each social account, personal account, company accounts, actively every day. Promote Facebook posts, even just $5, because Facebook basically doesn’t show brand content without paid promotion. 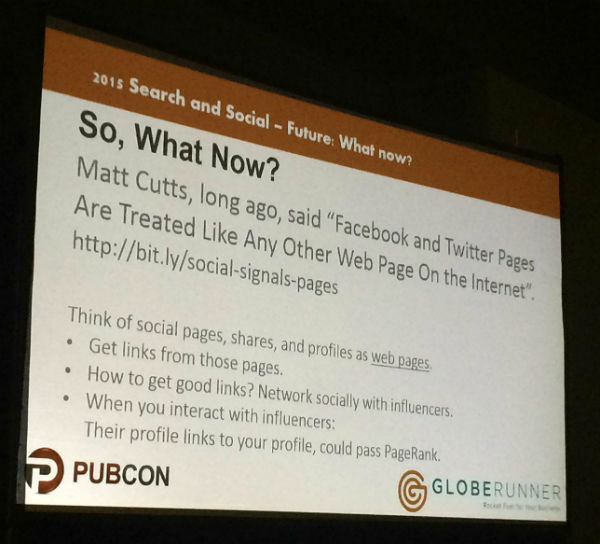 Google+: Don’t remove authorship from your sites. It may come back at any point if Google decides to use it again. He recommends that you optimize your profile on Google+ — fill out the entire fields and make it unique content. Share and create a visually rich experience. He normally doesn’t post at 5 o’clock on a Friday before leaving the office for the weekend because the promotion piece needs time to pull together. Write several versions of the title/headline/summaries, because you don’t want duplicate content. Promoting posts on social media sites — network with others to help promote. Bloggers write the alternate post, summary post and link to you. Promote both summary posts and main post. We know that +1s, tweets, and likes don’t count as social ranking signals. But we should keep sharing because traffic goes up with social visibility. You offer a pretty good summary, Abhinav. If only the work was as simple as explaining it. Site structure, engaging content, clear goals, understanding audience, paid amplification — all huge undertakings in their own right, and today businesses need to be excelling in all of the above to reach success. I’m getting into Inbound.org myself, lately, Mike. Thanks for reading! thanks for the tips on inbound.org and Growth hackers both awesome sites, Not sure about the other 2 though!